Turns out that dragons love tacos. If you want dragons to come to your party, you should definitely serve tacos. But be careful: If a dragon eats spicy salsa, you're in red-hot trouble. Written by Adam Rubin, illustrated by Daniel Salmieri, this New York Times bestseller is "a heaping helping of silly" (San Francisco Chronicle). Hardcover, 40 pages, ages 3-7. Hilarious two-piece printed jammies are 100% cotton. Children's sizes 2T, 3T, 4T, 5, 6. Machine wash. Made in USA. 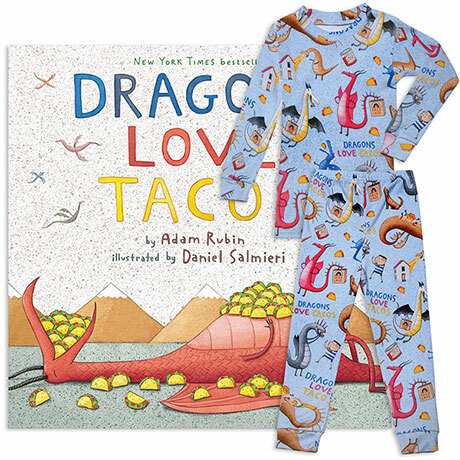 Set includes Dragons Love Tacos hardcover book and matching PJ's.